With no new James Bond movie coming out soon enough for Activision, we are indeed getting another polish of the GoldenEye remake for the Xbox 360 and PlayStation 3, as a screenshot dumpl from yesterday more or less confirmed. Today, the game is official, announced in the form of a press release that manages to neither mention the Nintendo 64 original or last year's Wii remake upon which this not-quite-new game is based. But who hasn't heard of at least the first GoldenEye, which for many players is the Bond gaming standard? Reloaded, like the Wii remake of last year, re-tells the events of the 1990s GoldenEye film, re-casting current Bond Daniel Craig in place of Pierce Brosnan. Some levels pay homage to the first game, but this is no level-by-level remake, not in single-player or multiplayer. Activision promises that the game will run at 60 frames per second and will support the PlayStation Move Sharpshooter gun controller for immersive play and (my words, not theirs), a control experience similar to what was offered last year on the Wii. "Additional to the legendary story campaign, the game introduces the brand new ‘Mi6 Ops Missions' – new, distinct levels separate from the campaign that span the varied environments from the story and challenge players to complete different Assault, Elimination, Stealth and Defense objectives. GoldenEye 007: Reloaded also takes multiplayer to new heights, maintaining and improving its renowned four-player split-screen action and adding full, adrenaline-pumping 16-player online matches with more maps, weapons, characters and game modes than ever before." The Wii version's online only supported eight players. The most distinct feature of last year's Wii remake was that, like the N64 original, it allowed players to sneak through their first-person shooter. You could shoot your way through each mission, but you could also be a better Bond, sniping security cameras, baffling enemy soldiers with nifty gadgets and keeping the body count as low as a suave agent should. 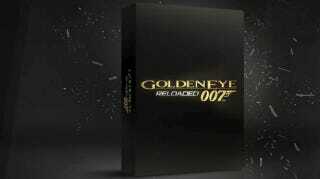 GoldenEye 007 Reloaded will be out this fall on PlayStation 3 and Xbox 360. That's fall of this year which is already stuffed with first-person shooters. Good luck, James.